The new technologies, scientific advances and democratization of access to information via the internet have reshaped democracy and individual involvement as well as the world’s political and financial order. Fear of automation, robots and Artificial Intelligence are transforming employment, training and education. Uncertainty, discontent and mistrust are paving the way to populism at a time dominated by a collective feeling of perplexity. 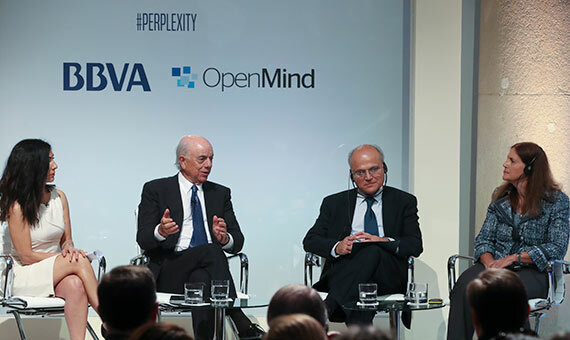 BBVA analyzes all of these challenges in the latest book in its OpenMind collection: “The Age of Perplexity. Rethinking the World We Knew.” Data has set the route for this age and the Digital Revolution has made our mental frameworks obsolete– Political, economic and social actors must respond to the change, facilitate the transition and rethink seemingly up-to-now unquestionable convictions. A path without a compass: how certain is the digital promise? Will the new technologies help to create a more prosperous and sustainable world? When transitioning to the digital world, can we expect poverty to be eradicated and inequality to be reduced? The digital transformation of the financial system; the role of the new media; and the impact of technological advances on productivity: these are three key elements to be able to answer these questions. Additionally, González underscores the need for global regulations of digital activities that prevent unprotected user data or digital fraud. In this context, in his article, González also stresses the importance of equipping users with “more rights and control over their data” in the face of digital providers. Diana Owen, professor of Political Science at Georgetown University, analyzes the role of the new media in political communication using the case of Donald Trump during and after his presidential campaign as a paradigm. How do politicians use the new media now? What is the effect on their image and the political decisions of voters of using these media? The phenomenon of mistaking politics for entertainment generates evident wear and tear of democracy. To restore the system’s credibility and transparency, we need good quality journalism that people can trust, says Own. Disseminating “fake news” (a term with “no clear definition yet” according to Diana Owen) has had a determinant impact on election results as well as the way people use social media. According to the researcher, the danger is that “this disinformation is becoming institutionalized.” The author’s thesis can be found in her article “The New Media’s Role in Politics,” where she also analyzes the influence of automatic software and the potential danger of manipulation using bots in the age of post-truth, mistrust and populism. Given that exponential technologies have entered our daily lives and our workplace, why has there not been a noticeable and consequent increase in productivity and purchasing power? “Their potential to deliver productivity growth has not been fully tapped,” states Zia Qureshi, researcher at the Brookings Institution. The slowdown of productivity in most economies seems to reflect growing inequality between the leading companies and all other companies. “To achieve better outcomes, we need policies that revitalize competition, spur innovation, upskilling and reskilling workers, and reforming social contracts,” argues the author in his article. The paradoxes currently faced by the economy can be analyzed from different positions as regards the potential of technology: techno-optimists, techno-pessimists and techno-adaptationists. However, it is vital to take measures that enable a dynamic transition at the intrinsically changing pace of the new technologies.